Get Dirty with Breathless Resorts & Spas! Breathless Resort & Spas is not afraid to get dirty if it means having some fun. Hey, we’re talking about mud people! Breathless Punta Cana Resort & Spa has a new weekly party you’re going to have to see to believe! Join us every Thursday at 11 a.m. on the beach for some good, old-fashioned fun in the mud! There will be a D.J., fresh coconut station, and cocktails from our beach bar! Not only can you dance the afternoon away but also get ready to be tested with a tug-of-war! 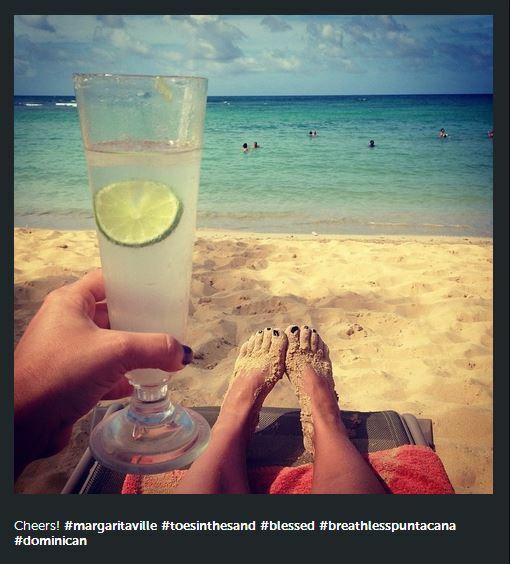 Share your Mud Party pics on Instagram, make sure you tag us @BreathlessResorts! Still curious? We have video proof of just how much fun we have getting dirty! 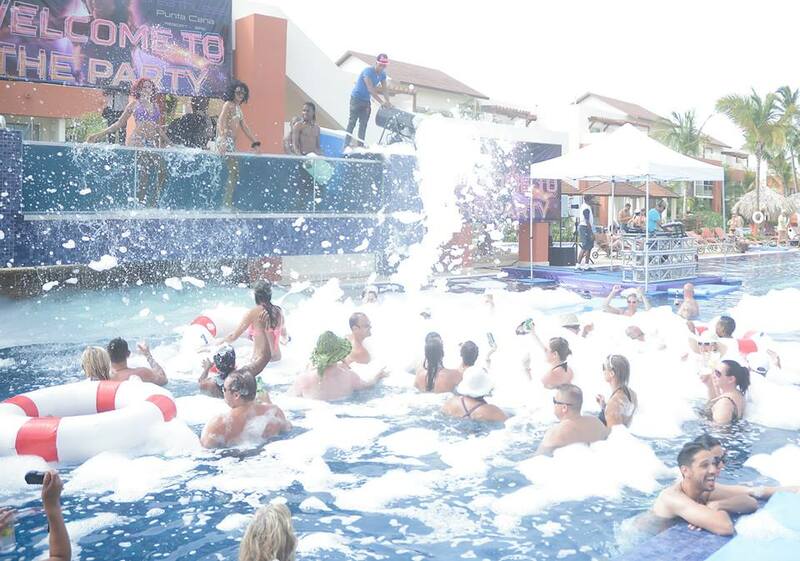 The party never stops at #PuntaCana! #BreathlessResorts sure knows how to throw a #mudparty! 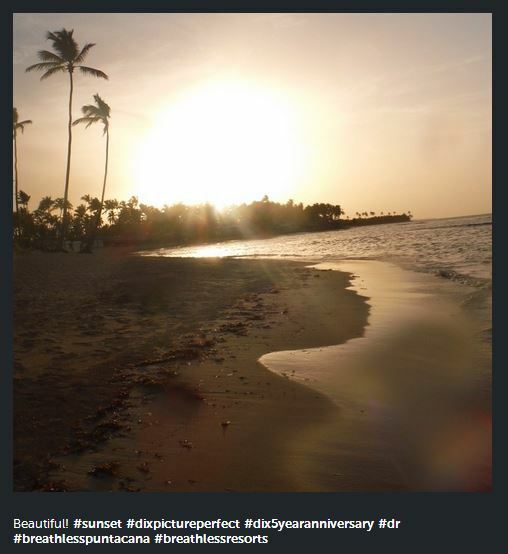 Experience unparalleled romance with a honeymoon at Breathless Punta Cana Resort & Spa! If you and your significant other are looking for an exciting, exhilarating, luxurious, and sensual honeymoon, Breathless Punta Cana Resort & Spa is the place for you! Set on the stunning northeast coast of the Dominican Republic, this chic adults-only destination is home to captivating beauty, non-stop adventure and Unlimited-Luxury®. You’ll experience the highest levels of luxury and personal service throughout your stay, making you and your loved one feel truly pampered! 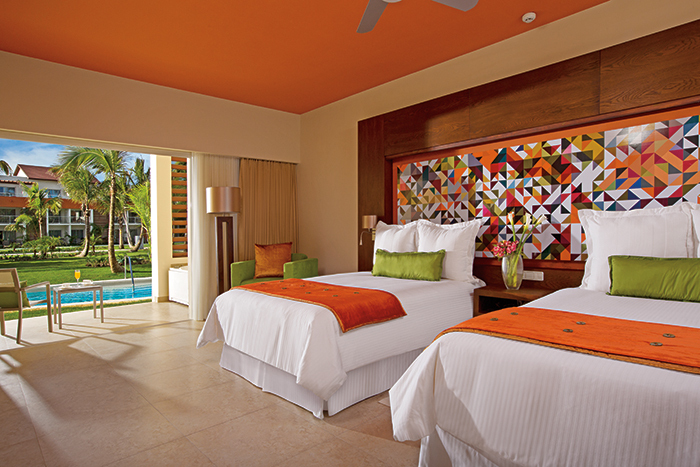 Start your lives together in the most perfect way at Breathless Punta Cana Resort & Spa. Our Make the Fish Blush Honeymoon Package is the perfect way to start the next chapter of your lives together. Your stay begins with sparkling wine, flowers and fresh fruit in your room upon arrival. You’ll also start the day right with breakfast in bed with mimosas and end it perfectly with seductive turn down service for one evening during your stay. Reconnect with yourself and your partner with a 50-minute couples massage treatment and complimentary access the the Spa’s wet areas for one day of your stay. To top it all off, both of you will be treated to the ultimate luxury experience with a private, romantic beachfront dinner for two including a bottle of wine so you can sip and savor each other’s company to the sounds of the sea. 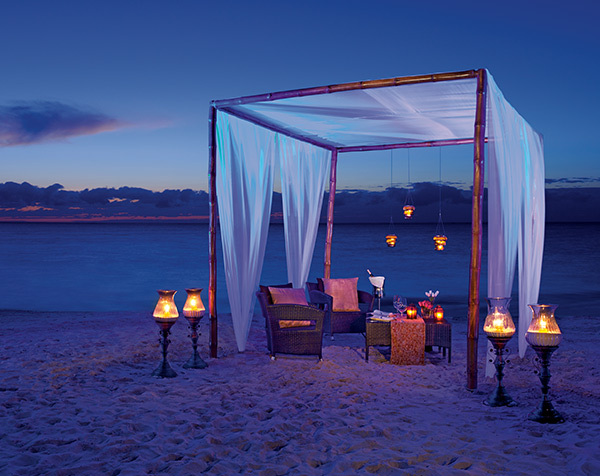 It doesn’t get any more romantic than a private dinner on the beach at Breathless Punta Cana Resort & Spa. Are you ready for the romantic experience of a lifetime? Book your honeymoon at Breathless Punta Cana Resort & Spa today! Do you have a good caption for this picture? Let us know on Facebook & Twitter! When you visit Breathless Resorts & Spas you can expect to experience certain things. You can expect a good time first and foremost. You can expect fine dining, unlimited premium spirits and a world-class spa. But what can you expect when you finally arrive at Breathless Punta Cana Resort & Spa after a day of travel and swing open the door of your suite for the first time? The spacious Allure Junior Suite Swim Up rooms with double beds feature ground floor access to a pool. You’ll find a king or two queen sized beds, perfect for the full nights of rest you’ll need. A fully furnished terrace or balcony for the view you’ll want to sit down and enjoy. You’ll find a complimentary mini-bar refreshed daily with beer, soft drinks and water. You’ll find complimentary bath amenities from Gilchrist & Soames®. Plus some things you won’t find in your room but you’ll love having while your enjoying your suite. How does 24-hour complimentary room service and nightly turn down service sound? 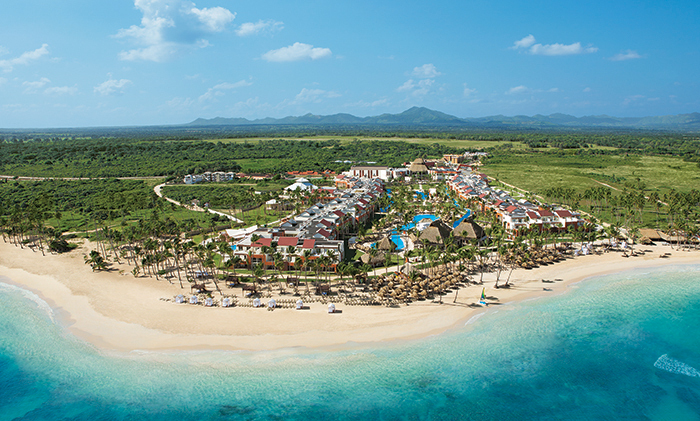 We expect you’re going to love Breathless Punta Cana Resort & Spa! Check out Pinterest to get the full view of the Unlimited-Luxury you can expect and share your experiences on Instagram! Tag us @BreathlessResorts! 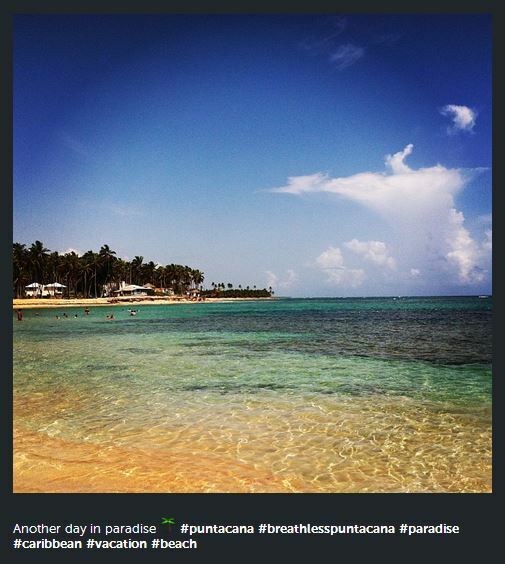 Meet the Breathless Punta Cana Staff! On today’s Wedding Wednesday, we have the privilege of introducing our fabulous Breathless Punta Cana Resort & Spa Wedding Coordinator, Natalia Colinas! From the general logistics to all the little details, Natalia is there for you every step of the way to make sure your special day goes as perfectly as you dreamed it would! 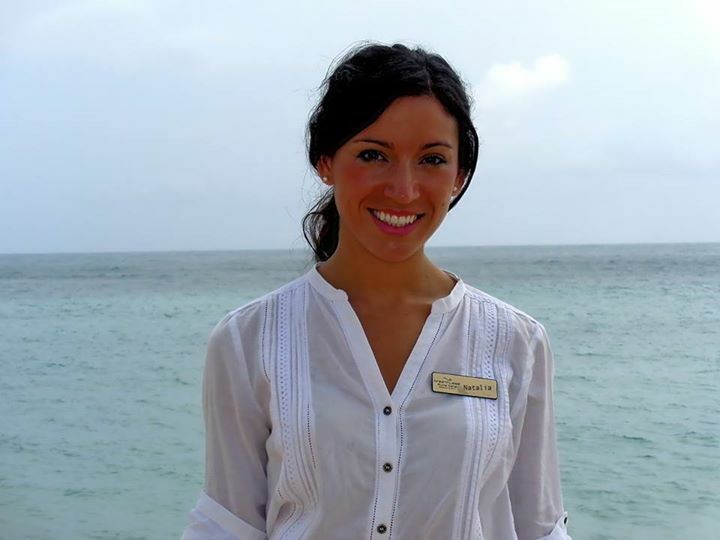 Meet Natalia Colinas, Breathless Punta Cana Resort & Spa’s very own wedding coordinator! Are you Ready to Wed? Contact Natalia at weddings.brepc@breathlessresorts.com and save your date by October 31, 2014 for a destination wedding between September 1, 2014 and March 31, 2015 for $500 in resort credits to use toward special touches that will make your wedding truly unique. When 10 rooms or more are booked for at least 3-nights each, the wedding couple stays free! Thanksgiving is, of course, a time to be thankful. Thankful for your family, your health and everything we have in life. It’s a time to take a moment from your busy life and appreciate. 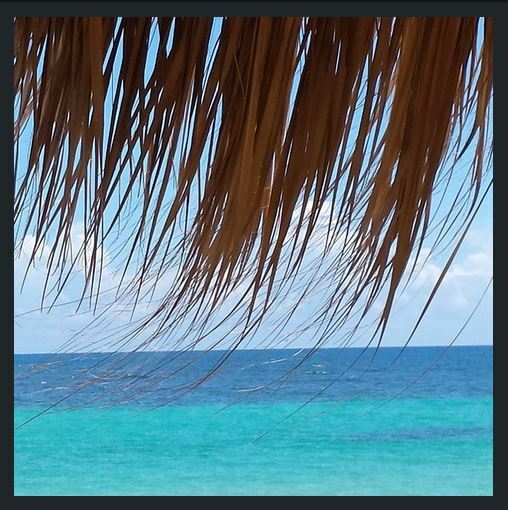 Can you think of a better place to do that other than Breathless Resort & Spa? Join us for all the Thanksgiving treats you love in a much more tropical location! First on our minds this Thanksgiving will be how thankful we are for all we have. Second on our minds? Food! 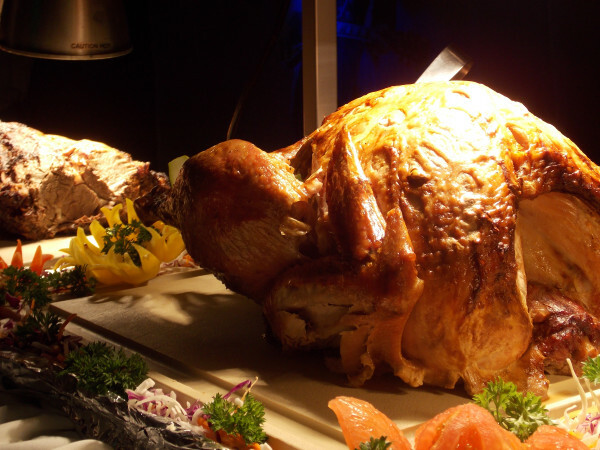 Join us for all your favorites; turkey, mashed potatoes, cranberry sauce and more! A great part of spending Thanksgiving in paradise is the weather! No rain or cold for us, we’ll be outside with a thanksgiving party you can’t believe! The top level of our Freestyle pool is the perfect place to take everything happening at Breathess Punta Cana Resort & Spa in. Keep your traditions alive with us! We’ll be watching the Macy’s Thanksgiving Day Parade plus all the football you can handle. 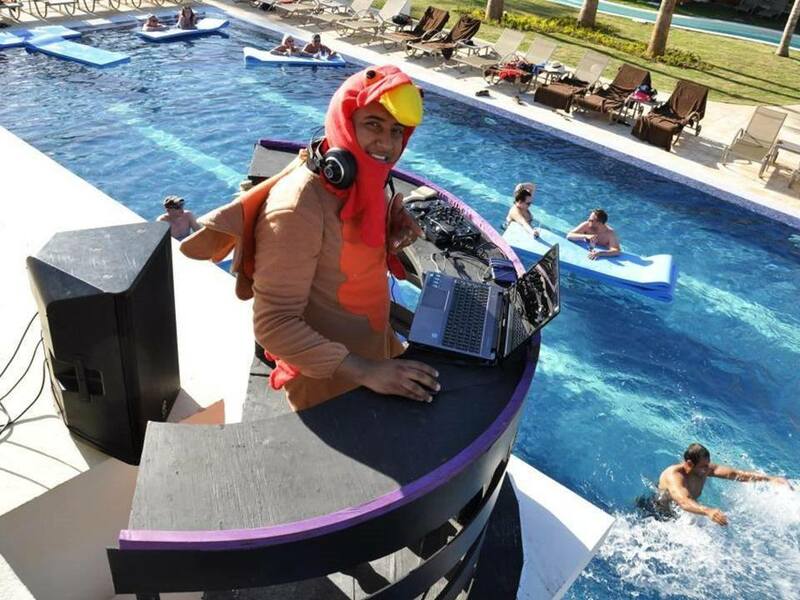 Or make new traditions, like a pool party with this feathered DJ! There’s plenty of time to book your trip and share this special holiday with us. Be thankful for our special offers and book now! 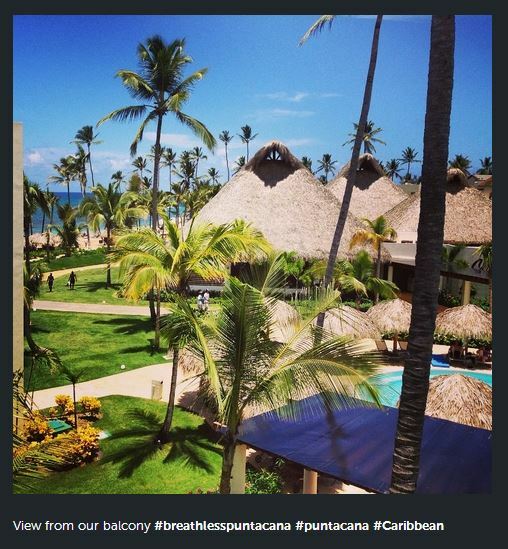 Expedia gives a big award to Breathless Punta Cana! While you were busy having a blast at Breathless Punta Cana Resort & Spa, Expedia released their annual awards and we were included! Of course it’s such an honor to be acknowledged in any respect but we are especially excited to be named Expedia’s Top New Hotel of 2013! Thank to Expedia and we can’t wait for all the parties to come! Head to Facebook & Twitter and offer your congratulations! Plus it’s a great time to check out our special offers and plan your next getaway! A vacation to Breathless Punta Cana Resort & Spa is not complete without a relaxing day at our world-class spa. The magnificent Breathless Spa by Pevonia provides the ultimate luxurious spa experience with dozens of pampering choices to rejuvenate the mind, body and soul. Our Breathless Spa Brochure highlights numerous treatments and therapies to indulge your every desire. With so many options, we’d like to highlight our Spa line’s unique Sabai Mineral Therapy® treatment. At the Breathless Spa by Pevonia, we aim to create an atmosphere that will immediately make you feel relaxed and at home. Sabai is a common Thai expression meaning ‘well-being.’ You can exhale and relax as this anti-stress therapy stimulates blood and lymphatic circulation, increases skin cell activity, and provides skin repair. As you completely unwind, tension, fatigue, and pain are gently vanquished, resulting in the ultimate relaxation. Customize your Sabai Mineral Therapy® experience with aromatic essential oils such as citrus, floral Neroli, soothing lavender or rejuvenating rosemary. After some spa time, you’ll feel like a brand-new fabulous you! 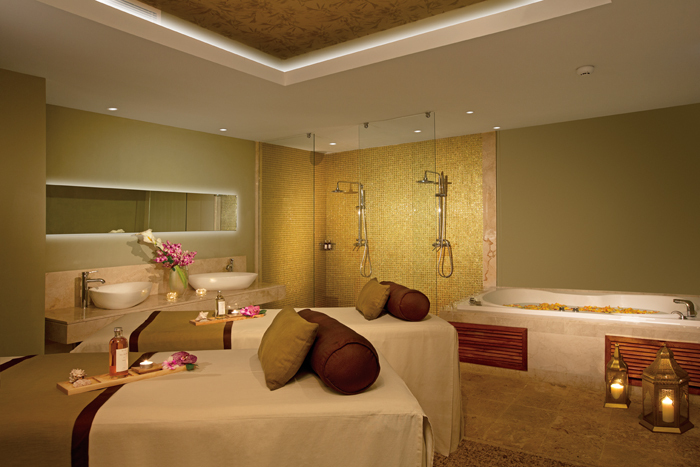 Banish stress with this treatment and many more at Breathless Punta Cana Resort & Spa. Book your stay today! Live from Twitter! What our Tweeps are Saying! 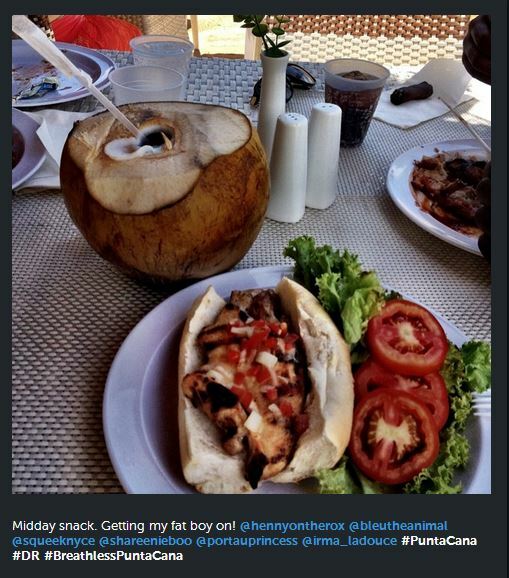 At Breathless Resorts & Spas, we love to hear about how much fun our guests are having straight from the source! 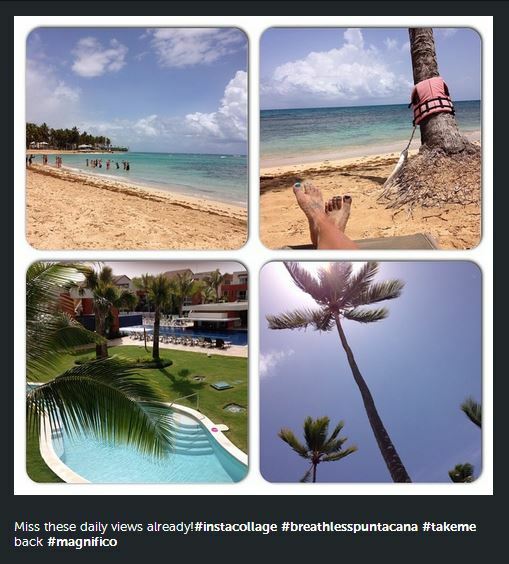 Check out some recent tweets from guests to see what they loved about their stay at Breathless Punta Cana. Don’t forget to follow us on twitter and tag us in your Tweets @BreathlessRsrts!